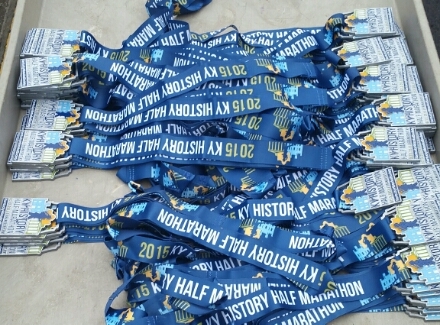 What do you do when a friend asks you to run a half marathon for her due to a fractured ankle? 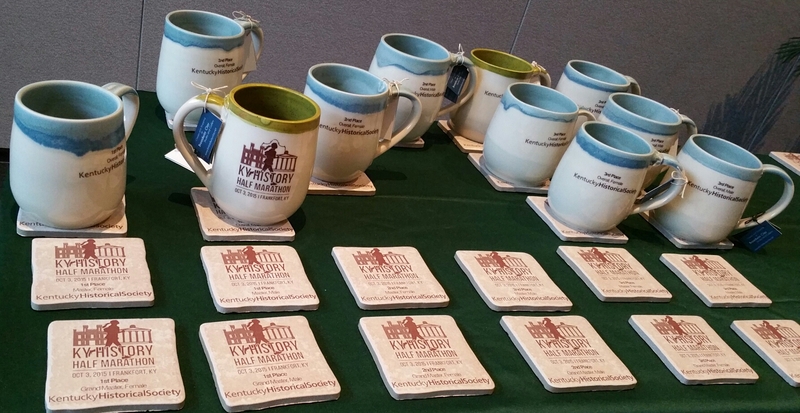 Packet pick up was available at the Kentucky Historical Society on Friday and Saturday. I decided to go Friday after work so I would have extra time to sleep in on Saturday. Frankfort is about an hour drive from Louisville. It rained the entire drive and the race forecast was calling for the same conditions. Gray, gender specific sized shirts were given out with the bibs. It was too late to modify Karen’s #24 bib so I made my own customization. This race was the easiest parking I have every dealt with for an event. It was convenient for a person like me who likes to make last minute adjustments to gear and getting that last bite of banana or sip of PowerAde. 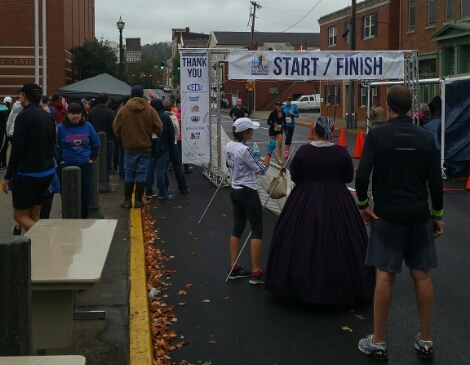 There was a 5k and a 10k which took place 10 minutes after the half. The half runners were sent off with the boom of a cannon. It was a good thing it rained all day Friday and throughout the night. Saturday greeted us with a light mist. I would have been OK with a short sleeved shirt. 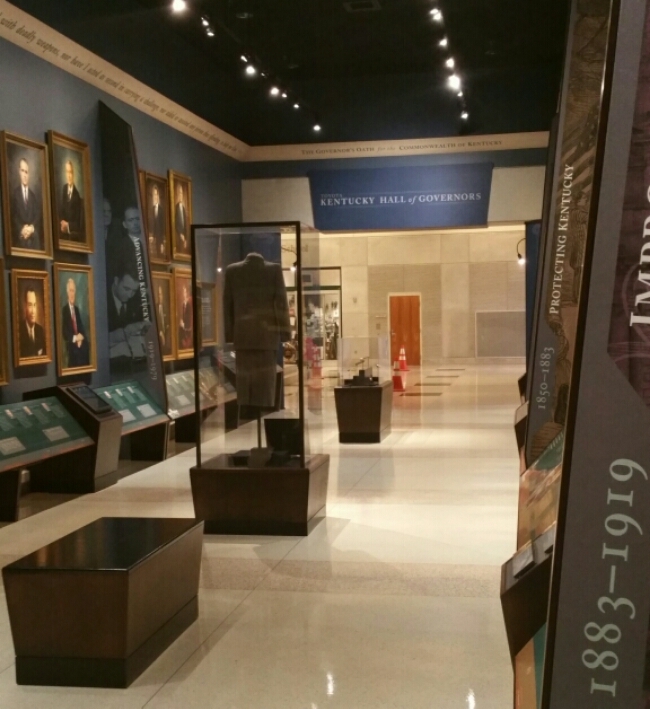 The first landmark was the First Baptist Church, then we passed the old governor’s mansion. We ran adjacent to railroad track on Broadway that passed the Old State House. We passed historical homes along Main Street before we made a right on Capitol Ave. I remembered this street from doing a walk with my job to support former “Biggest Loser” contestant, Coach Mo from Kentucky State in 2011. No one could have told me 4 years ago I would be in a half marathon on the same street. The leaders of the pack were already heading back towards US 60. I made my loop around the beautiful grounds of The New Capitol. I stayed on the inside to save unnecessary distance. Courses are always measured on the tightest tangents. I gazed at the perfectly manicured flower beds of Kentucky’s Executive Mansion. Between miles 3 and 4 was the longest sustained hill effort I have ever run in my life! I thought about the heavy resistance in my spin class I haven’t been too in ages. The muscle memory was still there as I took it slow and steady into the Frankfort Cemetery. This was my slowest mile at 9:31 which isn’t too bad for a half mile climb. The mile looping around the cemetery was dedicated as the Mile of Remembrance. I saw the Paul Sawyier gravesite along with the burial site of Daniel Boone and his wife Rebecca. The terrain was pretty flat with a few dips and inclines, but nothing major. What goes up, must come down! I took a third of a caramel GU left over from the Derby Marathon and chased it with water at the aid station. At this point, the voices I heard behind me the whole time in the cemetery passed by. It was the 2:00 pace group. I ran down US60 with care as to not pull any muscles. Downhill can be more harmful than uphill. Back to flat land on Main Street, I became acquainted with the Beast 2:00 Pace leader Eddie. He is a triple threat like me; teacher, foster parent, and runner. I told him the story about Karen, and we compared previous races as well as experiences as foster parents. The group varied between 2-4 people. Eddie said a few people dropped back on the US60 hill. The route took us into Kentucky River View Park. There were some people practicing Tai Chi. We took a long stretch down Wilkinson Blvd. The mist turned into a sprinkle. We passed the old site of a Hemp mill factory and the Buffalo Trace Distillery. The route got a little funky when we had to cut across a parking lot. It was worth it after leading to a Lewis Ferry Road along the Kentucky River. This was a down and back section that was so pretty with the rain water draining into the river. 10 miles down and a 5k to go. The rain stopped. I could see 1 of the 3 tall buildings in Frankfort and I knew I was getting closer to the finish. 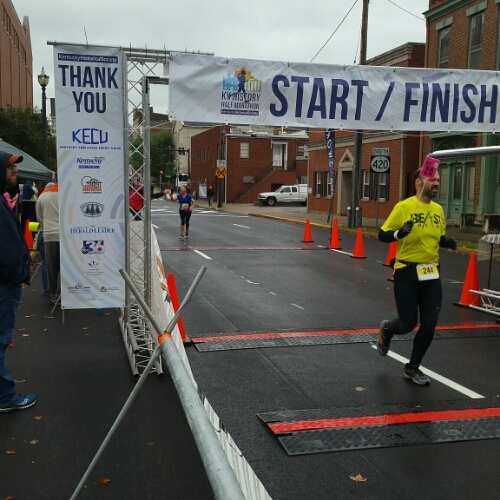 On the last mile, I decided to break off from the pace group and glide it in to the finish while clocking my fastest mile at 7:38. Official Time 1:57:33/ 8:58 pace. I have to compliment the convenient parking again because a 2 minute walk to my car to retrieve fresh clothes gave me life. There was bottled water at the finish line. Everyone was looking for food at the pavilion. It was better planned to have bananas, bagels, chewy granola bars, and candy inside a warm room. 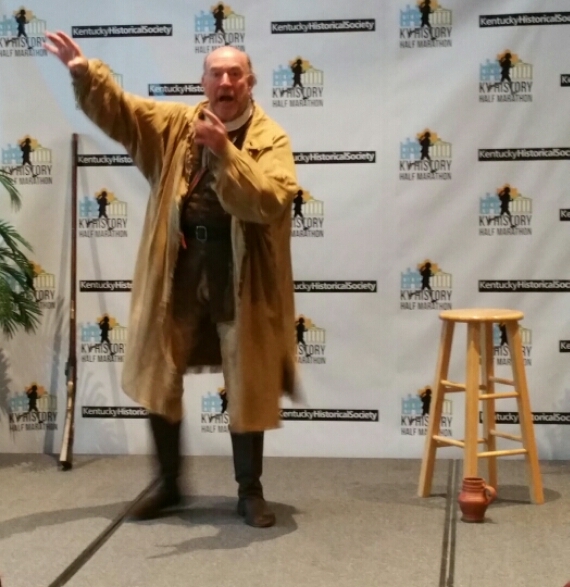 Another room had chairs set up for a Chautauqua performance of Daniel Boone and awards ceremony. 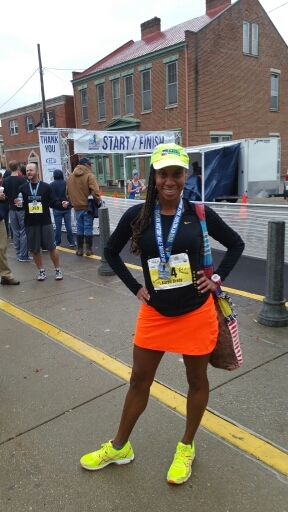 I jumped into a conversation with fellow runners who were giving feedback to one of the organizers. It was all positive. 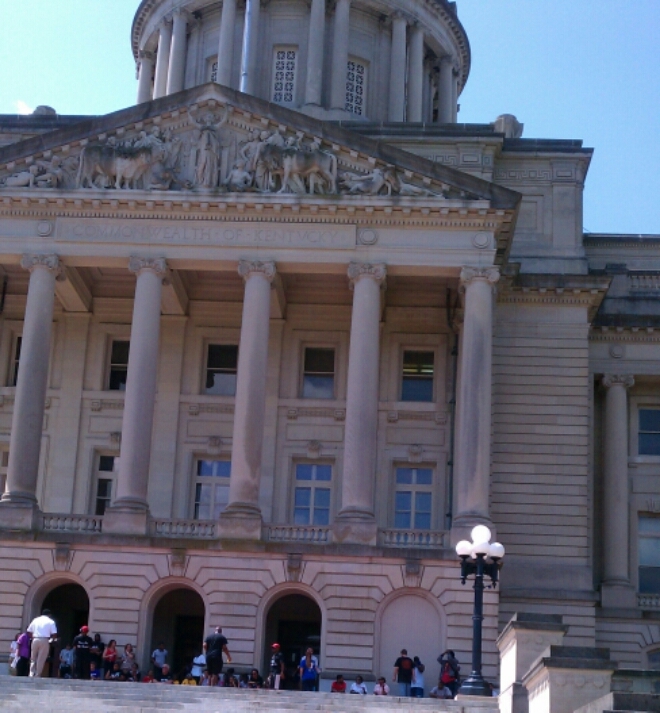 I really enjoyed the foot tour of Frankfort. As this race grows, I stated how the stretch of sidewalk along Wilkinson Blvd would be treacherous. I asked if they thought about blocking off at least one lane of the road. The lady said they tried to get the route to actually run through the distillery, but it didn’t get approved. 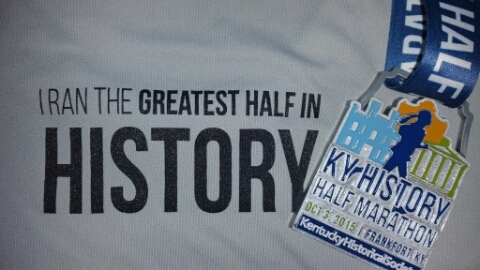 Overall, the KY History Half was a great course with beautiful views and a leg awakening hill climb. I can see the size doubling for next year. 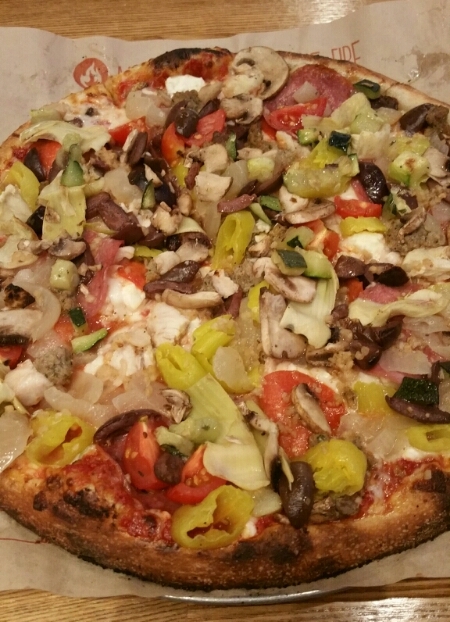 Later that night, my foster daughter and I went to Blaze Pizza in Middletown and refueled. This will be my new pizza spot with 50 toppings to chose from with the build-your-own option. Special thanks to Karen for the bib transfer! It won’t be long until you are killing it in your new age division with me! I was elated when Karen bought me this bottle with the "ie" spelling. 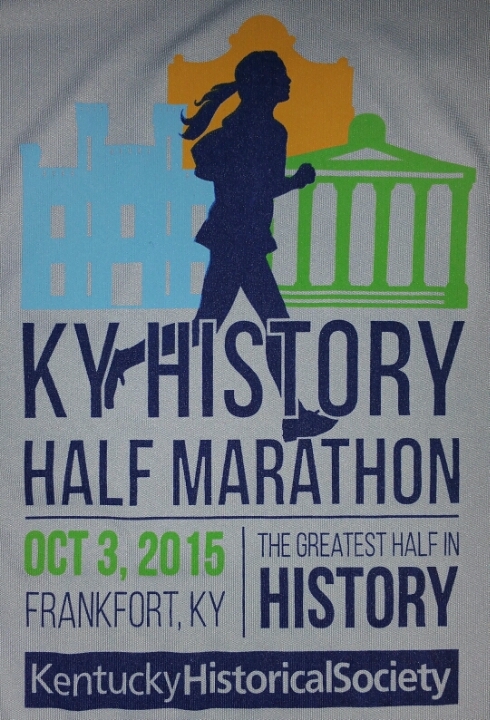 This entry was posted in fitness, half marathon, running and tagged Blaze Pizza, Frankfort, KY History Half Marathon. Bookmark the permalink. 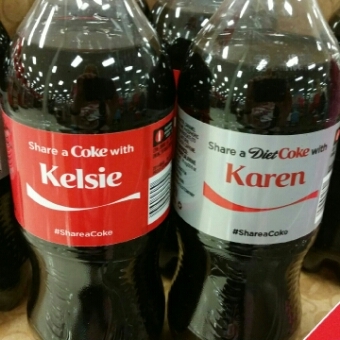 I’m so glad you got to run for Karen Kelsie! And I’m really glad you liked the race! I paced the 3:00 group and helped with all the training runs, come back again with Karen in the spring for the Trifecta Series! 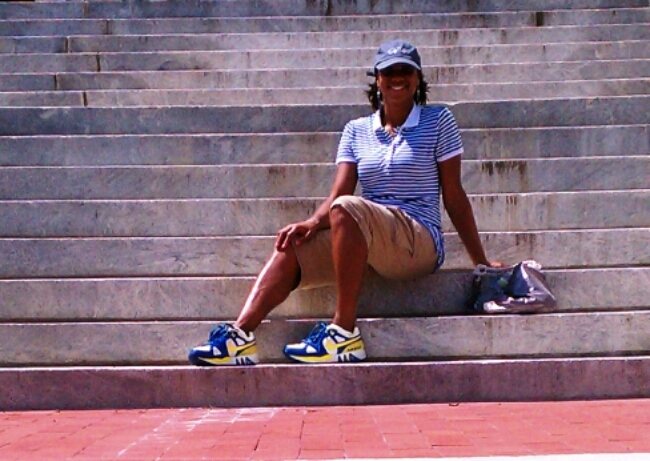 We have a blast going around that Capital building! Hi Linda! Thank you for reading my race recap and thank you for taking on the leadership role as a pacer. I think I saw your group coming up the hill and we were heading down. I remembered a pacer speaking to Eddie. Thank you for the suggestion about spring races. I will check them out! I remembered you telling me about it. We have to get together soon! Wish u were in Cincy. They are showing out for Queen Bee. There are not enough words available to let you know how this blog made me feel. You are an amazing, awesome, inspiring, strong, and gracious friend. I appreciate your friendship and am so thankful that you found my blog and we were able to meet and grow into good friends and running companions. Thank you for running this race for me. Thank you for saying nice things about Frankfort and the people there. Thank you for taking this experience in. 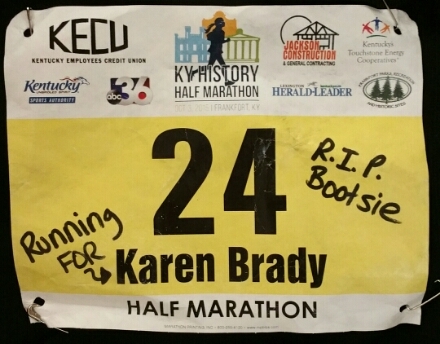 Thank you for the RIP Bootsie on the race bib…as it gave me a laugh I desperately needed. Thank you for everything you do…but for being there for me when I needed someone. Above all, that means the most. Have a great race this weekend and let’s get together for sure when you return!! ((HUGS)) You are the best, Kelsie!! I can’t wait to get back out on the road with you. You are very welcome and deserving Karen. Just to think, it all began with a Reindeer Romp. I’m so glad we have gotten to know each other and grow as great athletes together. I wish staying injury free was just as easy.